At Tilghman Orthodontics, we pride ourselves on helping our patients achieve healthy and beautiful smiles they can enjoy for a lifetime! Our talented doctors proudly provide outstanding orthodontic care to kids, teens and adults at our Berlin and Salisbury, MD orthodontic offices. Whether you’re looking for an orthodontist for your child or want to improve the appearance and health of your own smile, we welcome patients from all around Wicomico County, Worcester County, and the Eastern Shore. 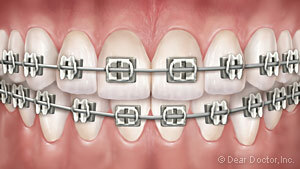 It’s extremely common to see adolescents, ranging anywhere from ages 11-15, with braces. In fact, braces are so common for teens that they’ve become something of a rite of passage, and for good reason. Treating misaligned teeth and bites during the adolescent years allows Drs. Tilghman and Schwartz to take advantage of the natural growth processes that occur during this stage of life. In many ways, adolescence provides us with a golden opportunity to fix orthodontic issues, so that we can give our teenage patients beautiful smiles that will last their entire life. While there is no set timetable for each child, generally between ages 11-13, all the primary teeth are gone, leaving a full set of permanent teeth in the mouth. This provides an orthodontist with the opportunity to correct problems like malocclusions or “bad bites,” improper spacing or poor tooth alignment. Unfortunately, orthodontic issues do not correct themselves, which is why it’s best to intervene as early as possible. As your teen grows and develops, oral issues become more complex, and costly to treat. 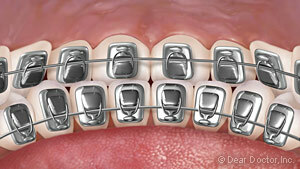 Traditional Metal Braces – One of our most reliable, effective, and popular treatment options are metal braces. They consist of small metal brackets that are glued to the teeth, with a thin wire running through them. Teens can choose the color of the elastic for the brackets for a more personalized look. At Tilghman Orthodontics, we use a smaller, lighter and more comfortable bracket to ensure the treatment process is smooth and comfortable. Clear Braces – These braces have the same elements as traditional braces, except that the brackets on the front side of the teeth are made of a clear, ceramic material. This makes the braces much less noticeable, making this a popular treatment method for older teens and adults. 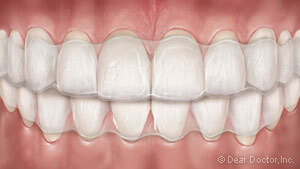 Lingual Braces – If teens want braces that are truly invisible, lingual braces are a viable treatment option. They’re placed behind the teeth, and work the same way metal braces do. However, these aren’t the best treatment for all orthodontic conditions, and Dr. Tilghman or Dr. Schwartz can answer all your questions about whether or not lingual braces are right for you. Invisalign Teen® – Invisalign clear aligners work by slowly moving your teeth into the desired position. Assuming that your teen wears the aligner the recommended 22 hours per day, and only removes them to eat, brush, and floss their teeth, they’ll continue to receive a new set of trays with each visit to complete their beautiful smile. Our Invisalign Teen aligners include “Compliance Indicators” to ensure the trays are being worn as prescribed. Come to all your scheduled appointments, and follow the instructions of your orthodontist. Do a great job of brushing and flossing to avoid common problems that can delay your treatment, like cavities and gum disease. Brushing once in the morning, after meals, and before bed is highly recommended. For flossing, we recommend using threaders to get in between the brackets. See your family dentist to ensure your teeth and gums are healthy. 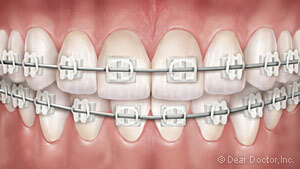 Contact us immediately if a part of your braces loosens or breaks. Contact Tilghman Orthodontics to Get Started! Is your teen ready for braces? Call us today at 410-742-4813 to speak with one of our dedicated staff members and schedule a consultation. With two orthodontic offices in Berlin and Salisbury, MD, we make getting treatment easy. We look forward to seeing you in our offices soon!